Are you a coffee lover or have someone on your gift list that is? 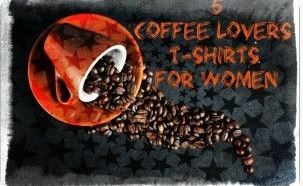 These 5 fun coffee lovers t shirts for women might just be what you’re looking for! See the Collection of Coffee Lovers T Shirts Here! These are just 5 of the many coffee t shirts available. They are available in a variety of sizes, including plus sizes, colors and styles. Love wearing hooded sweatshirts? Most are available in a hoodie which is perfect on a cool, crisp day.